Kays Kids: A Sewing afternoon. What is a bear to do? Home Sunday, with Granny and an old girl of a bear. This is not my thing, I want to be out on an adventure. Lace and fluff and stuff is not what I call an exciting afternoon. This old girl is certainly not finished, needles are flying and pins are every where. I do have to be careful where I sit. I think I look like one of those old photos that were taken when NO one smiles. Just so I didn't go stir crazy, we had the sport on the telly. This little bunny was finished this week, I was surprised he didn't want to play, he was more concerned about nibbling his carrot. Oh well a new day tomorrow, hopefully a much more exciting day. Now it's time for toast, honey and peanut butter, with a big glass of warm milk. I am certainly not dreaming about lace and fluff and stuff tonight. 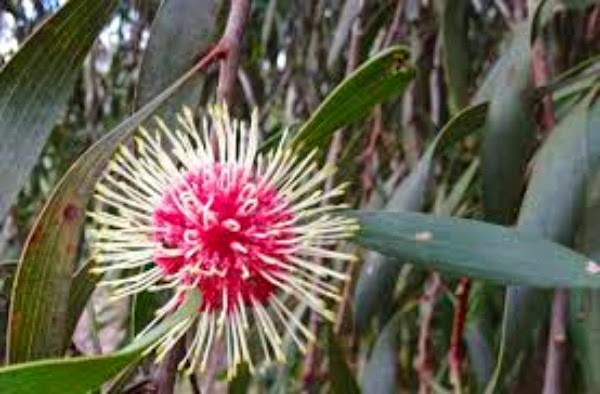 To all my beautiful followers, this Hakea flow is just for you. would you still be as hungry as when you started? Now, let Granny work, be quiet and calm, watch sport and within "no" time the other bear is finished and you can go for an adventure again! Oh, come on, that is a great portrait of you and your new little friend. You are so handsome, even when you aren't smilin'. Like at camp when you are in your bathers, fishin', you have a very serious look when you are catching dinner for around the campfire. Yes, the things a bear has to bear... But you're a tough boy, dear Wilbur, you can even stand all the lace and fluff... at least as long as the telly is on. And just be glad the bunny was only interested in his carrot - so it was more warm milk and honey toast for you! Yes I know those no smile pictures. lol I get excited when I see someone getting ready for something special. Especially if it has to do with lace and such. The rabbit is just hubbable! I hope the pasta anti pasta is true because that is what I am making for dinner tonight which means I can eat as much as I want! What a lovely laces you show us here and that is very special for playing with such material for once. LOVE your bunny's eyes, they look so precious! Wishing you a lovely new week. Even if you love the adventures with his grandmother, I see that you enjoyed sewing with your friend, you're beautiful in these photos! Great pictures! :))) Wilbur you are amazing! Oh, povero Wilbur, ti sei annoiato? Granny, invece, si sarà molto divertita! E quel coniglietto, come tutti i conigli, ama troppo le carote, non sa che è molto più divertente giocare con te! Ti auguro una settimana piena di cose divertenti! Hmmm..never thought of that. I must give it some thought..however..shooting from the hip, I would say..you would have to start all over and then the second time..DO NOT eat that antipasta! I mean..you don't want to do that all the day long when there is peanut butter and honey to eat..do you? Oh! Wilbur ... I just love that lace fluff and stuff and what a gracious face on "old girl bear" i think you have a very talented Granny.